Every once in a while I try gluten free flatbread options from stores, to see if they work out well to have around when entertaining. And pretty much every time I am disappointed. So here we are with a homemade option that is pliable, soft doesn’t have 20 ingredients and is versatile! This cauliflower flatbread has just 7 ingredients! Some steamed cauliflower, Psyllium, chickpea flour, tapioca starch, salt and herbs! It comes together quickly, is easy to roll out, and is super soft and pliable. These grain-free and nut-free(yes no almonds! 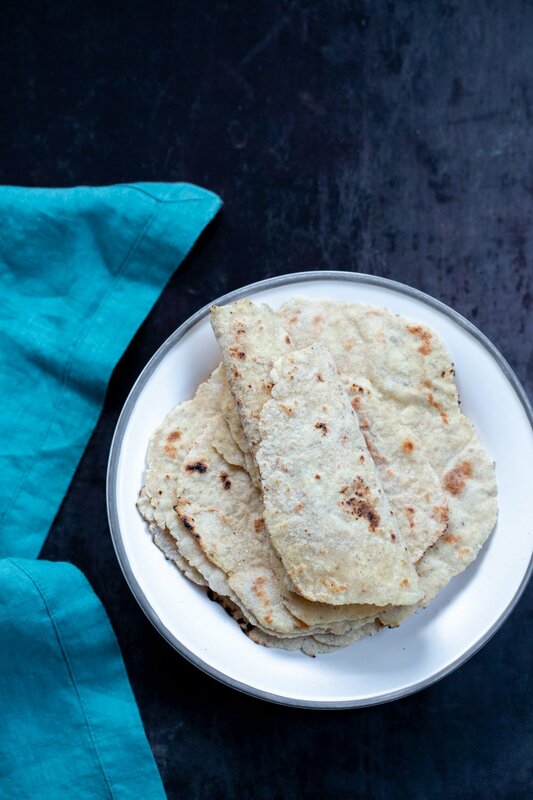 ), flatbreads can be made ahead and stored, so that you don’t have to stand in the kitchen to serve them fresh. Just warm up when needed. Use other veggie mash for variation. Flour and oil sub tips in notes. 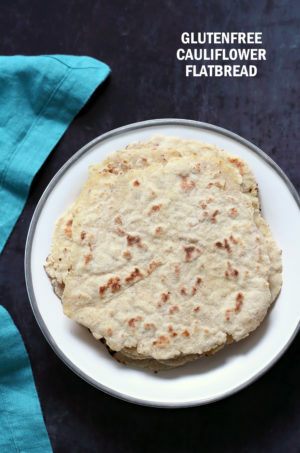 Try these flatbreads! Mix the dry into the wet to make a dough. Roll the dough out using rice flour or more chickpea flour. Cover the flatbread with a towel till ready to cook. 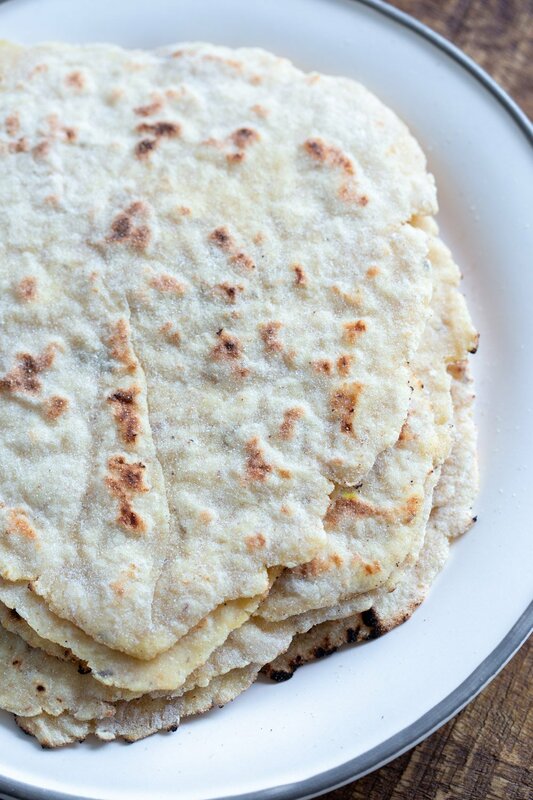 Store cooked flatbreads in a kitchen towel until ready to serve. 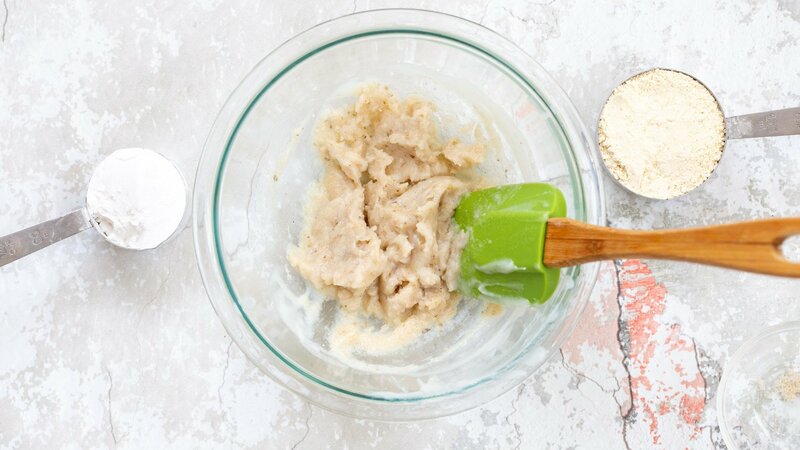 Drain and blend the cauliflower with 2 tablespoons water to puree. (you will need a small blender, or just mash very well into a smooth puree with the water). Add to a bowl with psyllium. Use 1 tbsp water to rinse out the blender and add to the bowl. Add the rest of the dry ingredients and mix well. Add oil and Get your hands (grease them) in there to make a somewhat dough. Add a tbsp or more chickpea flour if needed. Divide and Shape into balls and use flour or oil if needed on your hands. 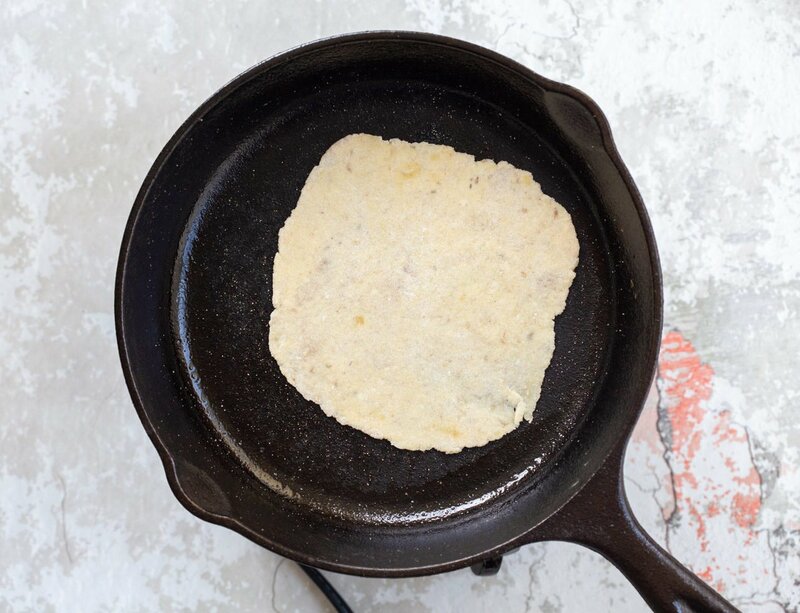 Use chickpea flour or rice flour to roll the balls out into 6 inch or so flatbread. Heat a thick bottom skillet over medium heat. 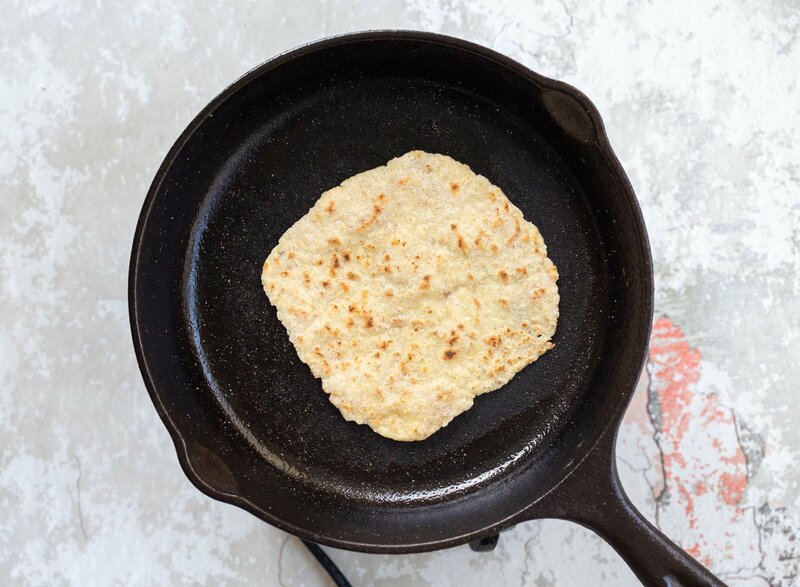 When hot, Cook the flatbreads for 2-3 minutes per side or until golden brown spots. Use a spatula to press the breads during cooking. Store covered with a towel until ready to eat.. These flatbreads are best when warm. Reheat on the skillet or microwave before serving. A brush of melted vegan butter or olive oil goes very well. Store in a cloth towel on the counter for the day. Fold in a paper towel and store in airtight container refrigerated for upto 5 days. Freeze for upto a month. 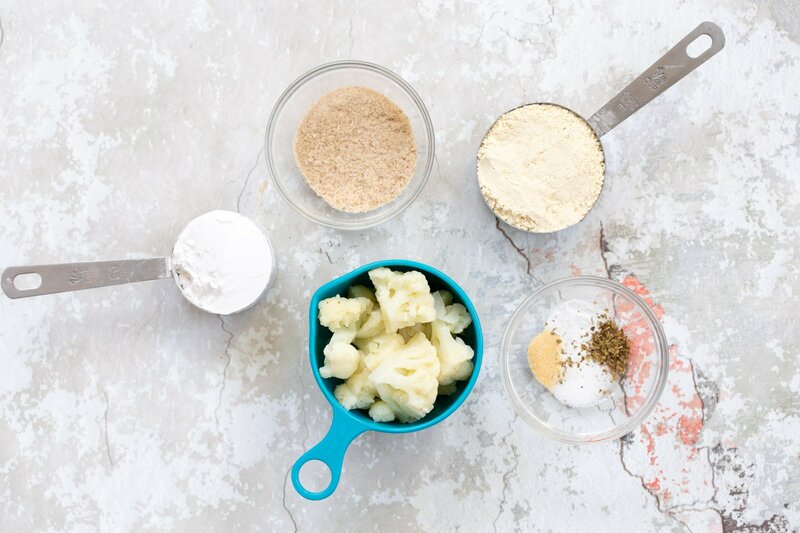 Variation: Use other well mashed or pureed veggies such as potato, sweet potato, parsnip, pumpkin, carrot instead of cauliflower for variation. Use other herbs of choice or add spices such as ground cumin, garam masala, or carom seeds. Oilfree: Omit the oil in the dough. Store the breads covered with a kitchen towel. Psyllium Husk: are generally available in flakes/husk form. Just put through a blender to powder and use. Substitute: Use chia seed meal. Put chia seeds in a blender to make a coarse powder and use. Chickpea flour substitute: Oat flour. sorghum or amaranth. Großartig, muss ich nachmachen, danke!!! I see that you are using psyllium husk in this recipe. I’ve only ever used it mixed with liquid as a gelling agent, or to just drank it straight up for a fiber boost. I was wondering if you could give me more information on the purpose of adding it to this recipe. Is it for binding the ingredients together? And if you have any other recommendation on how to use it that would be great! Yes it is the binding needed for glutenfree bread here and gluten, the binder is missing.You can use it to substitute some of the chia seeds in a chia seed pudding as well. Can I substitute some other binder for the psyllium because it doesn’t agree with me? Try chia seed meal. Chia seeds powdered into a coarse meal. Can you use coconut flour instead of chickpea flower? too much coconut flour will burn. You can use a combination. You also will need much less coconut flour as it absorbs water much more. Just add a bit at a time and mix in and let sit for half a minute before adding more. Add just enough to make a soft dough. Greetings to you! I am so excited to see this recipe! You’re a genius. I so appreciate the suggestions & substitutes that you include in your recipes. Thank you so very, very much. I finally got besan flour at my local grocery store. I have it in my freezer tonite and I’ll take it out tomorrow to use. I am truly so happy. Than you! This is the first time I’ve come across your recipes, and I’m excited! I’ve been doing keto for 6 months or so & I have almond meal & coconut meal already in my pantry, can I use them instead of chickpea flour? Also, I’m confused as to your nutritional panel. It says the percantage rekates to a 2000 calorie diet – I don’t count calories/kilojoules, but I do count the macro grams, esp carbs. How do I work out the percentage per hundred grams of flatbread? 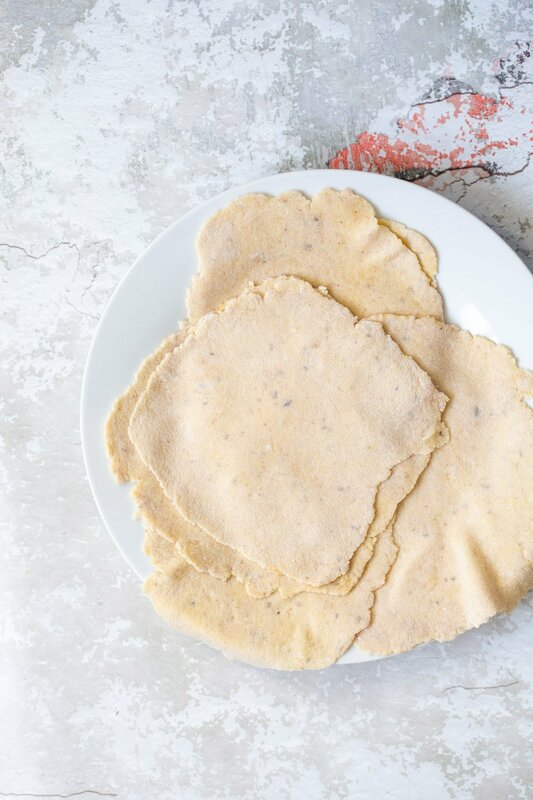 You can sub some of the chickpea flour with almond + coconut flour. Both those flours burn easily, so the recipe would have tobe modified a lot if using all almond or coconut. Thats just the widget option that i have. You can possible make the recipe and measure the weight of all the flatbreads so you have the total weight. That weight divided by serving size here will give you the gms of the serving size. Thank you for this recipe! I can’t wait to try it. I miss wraps and burritos. Can I use flax seed meal in place of psyllium? These flatbreads look PERFECT! Grain free, allergen-friendly, and versatile, I love them. Definitely will have to try these out one day! Starch makes it easy to roll out thinner and keep it softer. You can use just chickpea flour as well.You might need to roll it out with lighter pressure. And cook just to light golden spots. Brown spots will make the flatbread crispier. I’m completely blown away as these flat breads came together in no time and they cooked up like magic. I would have never imagined using cooked cauliflower along with the psyllium husk powder for flat bread. This recipe is a command performance for sure!! I had to use much more chickpea flour than the recipe stated…I found it difficult to roll out the dough (even on sprinkled chickpea flour) so just used my fingers. I did enjoy the taste though but next time will have to adjust the quantities. hmm lots of people made these without issues. your cauliflower might have more moisture or you accidentally used more water. I use not more than 3 tbsp. Did you use powdered psyllium husk? YesI only used 3 tbsp water + psyllium husk powder. Just commenting on my own experience with your recipe. how much more chickpea flour did you need? Did the psyllium gel into a thick mixture with the cauliflower ? I did not measure but at least 1/2 cup extra flour. No it did not thicken as you describe and it was a new packet of psyllium – not old. that seems to be the problem then. The psyllium should absorb a ton of the moisture to gel. So what remains is the stiff gel and it needs less flour to then form a dough. If the psyllium doesnt absorb the moisture then all that moisture will need more flour. Maybe it needed to sit a few mins longer to gel, or maybe its just a bad batch. See my video of the flatbread on my facebook page. You’ll see how it gels up. here is the link to the video. i’ll add a note in the instructions tomake sure its gelled up. it also explains the problems in rolling them out because psyllium is also the binder keeping things together somewhat like gluten. if it didnt gel, then it isnt binding either. So the dough will tend to be very delicate without the binding. These were really great! Thanks for all the amazing recipes! I made this with several substitutions based on what I had on hand – oat flour for the chickpea flour, potato for the cauliflower, and chia seeds for the psyllium husk. I ground the chia seeds in my Vitamix and then added enough water to ensure they turned into a gel. The result was tasty – and so easy to make! I was even able to brown the flat bread in a non-stick pan with no oil! I don’t eat oil, so the oil free option was much appreciated. Thank you for another great recipe! i followed the instructions and they turned out almost purple in color not white like your picture – is this normal? I used Psyllium seed powder which i read was the same as the husk. any ideas? safe to eat? i looked online and lots of people seem to have problems with psyllium powder making the baked goods purple. someone mentioned that the powder oxidizes after being ground and stored which caused things to turn purple. Its still edible. i havent had a problem with it since i always use husks and grind them as needed. Cauliflower is already steamed, I am about to make them! Oil is so important for our bodies, please do not omit it!!! I will definitely try this recipe in the next week! Made with cooked cauliflower previously and gave a 5 star rating. I decided to attempt with cooked/puréed sweet potatoes and the result was incredible as well. Easy to prepare and easy to enjoy. I’d go with whatever veggies on hand. These are a fantastic option Richa to go low carb!! Thanks so much for your amazing recipes!! Love the creativeness and the food always comes out amazingly flavorful!! Great Job!! I have made these twice now and they are absolutely amazing. They work great for wraps but also are good with a curry or stew. Thank you so much for giving us this great recipe. Oh my Gosh, these were so easy and so Delicious! after so many fails with other glutenfree flatbreads. i have a winner! Yes you can use regular flour. You might also not need psyllium with wheat based flours.